To the Ancient Greeks, Zeus was not a myth. Neither was Poseidon, Hercules, Perseus, or Hades. These were real gods and demigods. The landscape of Greece and Italy still have the ruins of the temples that once stood to pay homage to these divine beings. So what happened? The answer is actually rather simple. People stopped believing. It had always been the belief that as long as the gods were worshiped and prayed to that they would be strong. All except Hades who obtained his strength through fear. 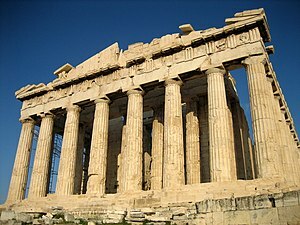 The Romans had a similar pantheon of gods and the biggest difference between the Greeks and the Romans (aside from the names) was that the Greek deities resided on Mt. Olympus, again except for Hades who lived in the under-world. The disappearance of these deities changed the religions and beliefs of ancient times into the myths of modern times. The question now is, are the current gods that are worshiped (Yahweh, Allah, Jesus, etc.) any different? Is it possible that God is just an imaginary friend to a theist and as a result completely nonexistent to an atheist? If science is the source of absolute truth then it would seem that we have no known origin, no known purpose, and no watchful father-like deity that we can turn to. We are just meaningless globs of matter and when we expire we decompose into dust and are no more significant than the dirt we are buried in. The various emotions experienced by mankind of love, joy, sadness and hope are mere chemical reactions that have evolved over time and our sense of morality is just a natural evolutionary code of ethics that developed over time as man increased in intelligence and furthered technology. We have nothing beyond the realm of current existence and life beyond the grave is nothing more than the musings of mythology and fairy tales. Now, I know that I used some parallels that some may think are extreme comparisons. In a world of instant gratification, reality TV, self-help speakers, and personal conveniences it becomes almost impossible to realize that we are just specks of dust in relation to the enormity of the cosmos and that our own little realities are irrelevant in the grand design. So just as we pay no mention to the colonies of ants we destroy when we spray pesticides, the tides take no notice of the villages that are destroyed when an earthquake triggers a tsunami. Evil and Satan are easy cop outs (I will expand on these in my next post), but the balance of nature is the true cause. So does this chaotic cosmos have a Creator? Does God exist? Well a scientist will tell you that God cannot be proven. God cannot be seen and cannot be tested. So let’s use their logic as we review a few concepts. Can we prove why a compass will always point north? The theory is that the earth has an invisible magnetic field that causes this. Gravity is also invisible and yet it is the undisputed reason given for why whatever goes up must come down. The winds cannot be seen, yet scientists have been able to discover that the changes in atmospheric pressure (also something invisible) in conjunction with the rotation of the earth and it revolution are what causes the wind. The sun emits light that is generated from a burning ball of fire and gases in space. This light is invisible yet enables one to see. This light is invisible yet when gather through a lens can burn a piece of paper. Light from the sun also warms the surface of the whole planet. I have given some completely invisible scientific theories that have not been disputed and I do not dispute these theories, nor do I reject the science behind them even though they use unseen concepts as their basis of proof. If the unseen can be proven in scientific theory, why is it not acceptable as proof of Deity? How can one dispute the positive impact that God, whether a provable entity or not, has on the most faithful of people? Can we deny that people are moved by their faith in God to be charitable? Can we deny the fact that people are willing to give up their own lives for these beliefs? Can we deny that the truly faithful try to live a life of humility and selflessness? Can we deny the hope that otherwise hopeless people feel when they discover faith? Can we deny the inner strength a person may feel after a sincere prayer? Faith in God will vary from person to person. It is not a conclusive science, nor will it ever be. It has been said that God is Light. Which is ironic because we can’t see light and we can’t see God either. We can feel the warmth caused by light of the sun and a believer can feel God by the warmth within their soul. Maybe God is imaginary or maybe God is calling and only those with ears to hear and are listening. See, three words. I will assume some of you don’t know what these words mean so I will explain them. Eyeh asher eyeh is Hebrew for “I shall be what I shall be” it has also been translated “I am what/that I am.” This statement is as brilliant as it is cryptic. No actual name is given, no definitive divine description, just an open-ended concept of indescribable and ineffable supremacy. There is a misconception amongst people who consider themselves to be atheists that the rejection of an interventional deity means they also reject the concept of a supreme intelligence or ultimate reality. The use of “Reason” and “Intellect” is a valid approach to such a topic and given the advancement of science and technology over the past few centuries (especially the last decade) we have seen the scope of the Divine drastically diminish. Galileo shattered the long-held belief that the earth was flat, the sky was a canopy, and the celestial bodies were mere lights in the canopy. Astronauts erased the concept of heaven being a paradise amongst the clouds in the skies, thereby casting serious doubt on chariots of fire and men “ascending into heaven”. Medical advancements have saved people from death, even brought people back from death-like states (ie. coma). Stem cell research has now advanced to the state where scientist are capable of manipulating and even splicing cells to regenerate organs. Carbon dating has identified artifacts that date the age of human civilization far beyond the Biblical timeline. However, the idea that the rejection of any religious text, creed, or doctrine or the literal or scientific debunking of them eliminates the concept of Deity is inaccurate, ignorant and irresponsible. Regardless of how far we go with science or how many theories we develop we still have not been able to discern the origin, source, or “author” of the various laws of nature and science. We have not been able to explain or discover the power that allows these laws to be executed in endless perpetuity. No explanations exist for the reason or cause of human emotions or our ability to discern the basic precepts of universal morality. This origin and this perpetual source is that supreme and ultimate reality that mankind has tried to understand. Whether through scientific exploration or theosophic study, the Divine is ineffable and we are not capable of understanding. For most of recorded history mankind has made many attempts at understanding this source. Our inability to prove or disprove the source or origin expels us from the right to deny it. The belief that this source is an interventional God is the belief of over 3 billion people and it has been for thousands of years. The concept of an interventional God is not based on facts though. It is based on faith. If one chooses not to believe in an interventional god that is fine. It does not rule out the fact that there is a an original and perpetual source of the universe though. If you base your belief on science, than nature or science is your deity. If you believe there is no source and everything just happened then chaos is your deity. However, out of chaos came order. Where did this order come from? Our sense of reason can serve as both a gift and a curse. While one can reasonably discern various laws of science and morality, you can also box yourself in to your own limited knowledge of the universe which limits the greatness of it. The Age of Enlightenment gave rise to skepticism and literal criticism of religious texts but, it did not render them obsolete. It is Jewish tradition that the Scriptures (Torah, Prophets, Hagiographa) were written by men for men and in the language of men. A literal interpretation of the text is not conducive to modern times as many of the mythical occurrences were similar to modern-day special effects in movies. The scribes wrote the text to instruct the simple-minded while the learned minds of the time labored for hours over the hidden meanings and allegories. Is an intense study of these texts still required? Perhaps for some but, the morality that has derived from their writing are now commonplace in a civilized society. As rich as religious text are in their allegory and moral lessons, they can easily be taken out of context mainly because, unlike the US Constitution they can not be amended. There is a revelation that continues to evolve and is infallible – nature. A walk along the seashore, a hike in the mountains, or a rafting trip on a river display the awesome power and beauty of nature. Gazing at the night sky on a clear night is a mind-boggling display of the vastness of the cosmos. Taking all of this in, is it remotely possible that there was no order, no source, and that all is chaos? Atheism advocates the absence of an orginal source or intelligent design. If there is no source – then universe is an illusion.